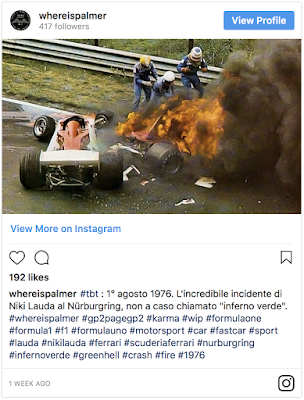 The German Grand Prix has been held 75 times and has been part of the FIA Formula One World Championship since 1951, so it is safe to say that in that time a few pretty memorable events have occurred there. Since the Second World War the race has been hosted by three venues: Hockenheimring, the Nürburgring Nordschleife, and at a shorter version of the Nürburgring and there have been plenty of unforgettable moments. Here are seven momentous German Grand Prix moments. The 1994 F1 season saw the return of in-race refuelling and a few drivers and team bosses worried about the dangers of fuel spraying over red-hot F1 cars, but for the first eight races of the championship it was a case of so far so good. …but then came the German Grand Prix. On lap 47, Jos Verstappen stopped in the pits for fuel and tyres. As the refuelling mechanic inserted the fuel hose a clear liquid was seen spraying all over the car. An eerie calm followed before a huge explosion engulfed Verstappen’s Benetton B194 and his mechanics. The cause? Benetton had fiddled with the refuelling components in an attempt to ensure a quicker stop. Naughty. The result? Thankfully, the ensuing fireball was quickly extinguished, Verstappen and a mechanic escaped with minor burns and Gerhard Berger went on to win a crazy race that was dogged by political squabbling and a first corner smash that eliminated ten cars on the spot. By the time of the 2009 German Grand Prix Mark Webber was in his third season with Red Bull Racing and despite clocking up four podium finishes, his first Grand Prix victory eluded him. That was until F1 returned to the reconfigured Nürburgring, under the banner of the German Grand Prix, for the first time since 1985. Webber confirmed the promise he had been showing since coming into F1 back in 2002 and nailed pole position, the first of his career, ahead of the Brawn-Mercedes machines of Rubens Barrichello and Jenson Button. In the race Webber led home a memorable Red Bull Racing one-two in front of Sebastian Vettel, sealing a hugely popular victory and becoming the first Australian to win a Grand Prix since Alan Jones triumphed in the 1981 Caesars Palace Grand Prix. Perhaps one of F1’s most bizarre (and comical) moments happened during the 1982 German Grand Prix at Hockenheim. Reigning World Champion Nelson Piquet was easily leading the race in his BMW-powered Brabham and on lap 18 and approaching the newly installed Ostkurve chicane he caught the lapped car of backmarker Eliseo Salazar. "Quite what Salazar thought he was doing…and I have to say that is an absolute disgrace," James Hunt, BBC commentator. As Piquet went to pass Salazar the Columbian driver inexplicably hit Piquet’s Brabham from behind and sent both cars spinning out of the race. The furious Piquet leaped from his car, confronted the hapless Salazar and shoved, punched and kicked him in an act of aggression rarely seen (in front of the cameras at least) in the civilised world of F1. After the dust had settled the Brabham mechanics discovered that Piquet’s engine wouldn’t have lasted the race distance anyway. The 1982 season was so full of drama and tragedy not even movie director Ron Howard could’ve come up with a crazier plot. By the time of the German Grand Prix, F1 had witnessed a driver’s strike, the death of popular Ferrari driver Gilles Villeneuve, and in practice for the race at Hockenheim Ferrari suffered another catastrophic blow. Didier Pironi, the man expected to win the driver’s title had a monumental airborne accident in practice, smashing his legs and ending his career. On race day it was left to Villeneuve’s replacement Patrick Tambay to climb into the sole Ferrari, tackle the high-speed straights of Hockenheim and bring the number 27 car home to score a memorable and emotional win for the prancing horse. Back in the 1960s the original 13-odd mile long Nürburgring Nordschlife was a daunting prospect for any driver. "The track is narrow, the undulations so pronounced, the bends so numerous, that you can hardly remember where you are on the circuit even on a clear day, but in fog and ceaseless spray you just have no idea at all," .Jackie Stewart. Jackie Stewart called it ‘the green hell’ and his drive on that August afternoon at the German Grand Prix in appalling conditions has gone down as legend. "When I left home to race at the German Grand Prix, I always used to pause at the end of my driveway and take a long look back at my house. I was never sure I would come home again." In heavy rain and fog, the Scottish driver, racing with a broken wrist, sailed his Matra-Ford in zero visibility through the spray to win the race a massive four minutes ahead of Graham Hill. The skill and bravery Stewart displayed in a race he himself thought should have been cancelled remains one of the finest displays by any F1 driver ever. The 1976 F1 season had it all. The British upstart James Hunt against the cool and calculated Austrian world champion Niki Lauda. McLaren Vs Ferrari. And at the German Grand Prix that year, the notorious Nürburgring would be the scene for one of the most dramatic events in F1 history. Reigning champion Lauda crashed at speed on lap two and as his Ferrari slewed to a halt burst into flames and was hit by two other cars. Grainy footage dramatically shows the Austrian trapped in his burning car as drivers Guy Edwards, Arturo Merzario, Brett Lunger and Harald Ertl heroically struggle to free him. Lauda suffered serious burns and almost fatal smoke inhalation. He was given the last rites by a priest, but in a super human feat of recovery was back at the wheel of his car two races later. "I am bandaged, blind and dumb. A man appears: I understand it’s the priest. He speaks Latin, it sounds like a judgement, the last rites. It makes me so cross – I want to shout: HEY STOP, THIS IS THE WORST F***-UP YOU MAKE IN YOUR LIFE. I AM NOT GOING TO DIE." When all was said and done, Lauda only lost the 1976 driver’s title by one point to Hunt and went on to regain his F1 crown in 1977. F1 never returned to the original Nürburgring Nordschleife. The 1995 F1 season was the first where German fans could see a reigning world champion on home soil. By the time of the 1995 German Grand Prix at Hockenheim, Michael Schumacher fever was everywhere, and as the championship battle heated up with British rival Damon Hill, the partisan crowd were desperate to see their new hero win. On a hot summer day the capacity crowd basked in sun and scadenfreude as they witnessed Hill’s Williams spin off into the barriers leaving Schumacher and Benetton to make history. The fact this happened right in front of the densely packed stadium section only added to the fan’s delight and Schumacher cruised to his first German Grand Prix victory and place one hand on the 1995 title. The German Grand Prix at Nurburgring would be one of the last races of the 1939 season, due to the outbreak of World War II in September, but as that event took place months before, contention was still as hot as ever. This week marks the 77th running of the German Grand Prix. This biennial event has hosted Grand Prix and Formula 1 races since 1926 and is recently returning to the Formula 1 schedule as the Premier German Racing Event. We here at l'art et l'automobile are definitely not going to miss this illustrious event, and we very much hope that you will be joining us as well. To that end, we have gathered a collection of Artifacts and Memorabilia from this momentous race and are providing it to you, our followers. Follow this link to our Newsfeed, where you will find a sampling of the collection as well as a link to find all the German GP artwork and Automobilia we have to offer. 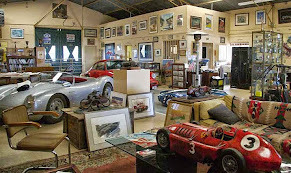 Please feel free to tour the gallery here, and perhaps you will find something to add to your collection.